The vacuum meter VAM-320 is a compact vacuum meter for measuring vacuum pressure and absolute pressure. The sensor and housing of the vacuum meter are resistant to acids and solvents, so its life span is very high. The application field of the vacuum meter is very broad. This vacuum meter of pressure is often used in the chemical industry or in laboratories. The vacuum meter is also used in the control and regulation of processes. The vacuum meter is delivered with a head, a charger and a factory certification of 2 points. You can optionally request an ISO certificate of a 3-point calibration. 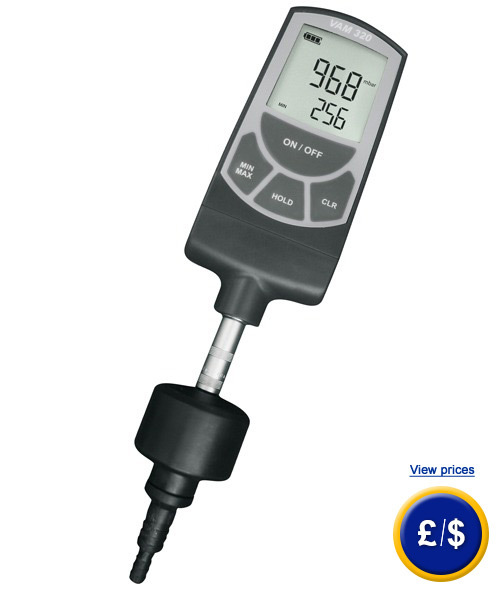 At the following link you can find the vacuum meter that is most suited to your needs.